The first wind test of its kind in the world determines that the lightweight, pre-vegetated Xeroflor green roof system can withstand violent storms and near hurricane winds. XF301 Sedum Standard system in full bloom. A new test - the first of its kind in the world - determined that Xeroflor's lightweight green roof system has proven its ability to withstand violent storms and near hurricane winds. 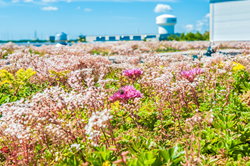 The XF301 Sedum Standard pre-vegetated green roof assembly recently tested to CAN/CSA A 123.24 and proved itself under vigorous wind uplift pressure and flow conditions at the National Research Council of Canada. While Xeroflor's system has been previously tested in Germany for wind, this is the first North American test. Xeroflor was also a key industry partner in the development of the Canadian Standard Test Method for Wind Resistance of Modular Vegetated Roof Assembly (CAN/CSA A 123.24). This method measures the wind uplift resistance of a green roof system and provides a tool for the designers and building officials to evaluate its suitability for specific projects to ensure public safety. The XF301 Sedum Standard, one of the lightest green roof systems available on the market, sustained a wind speed of 170 km/h (106 mph) and a wind pressure of 9.6 kPa (200 psf). The green roof system was intentionally tested at a drier than normal service condition at only 27 kg/m2 (5.6 psf) to obtain more conservative results. This remarkable lightweight system is a German technology with roots that go back four decades when Xeroflor invented the pre-vegetated mat. Today, this innovative system is found on landmark buildings around the world and is most highly regarded for its high water-retention-weight ratio. Please contact Xeroflor Canada for more info on Report A1-004442 issued by the National Research Council Canada on February 10, 2016.